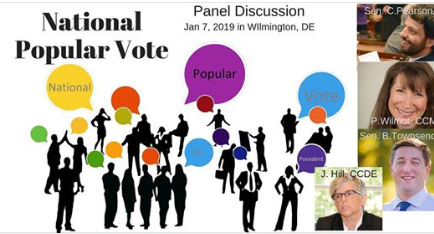 More than half a dozen members of the League of Women Voters of Sussex County attended a panel discussion on the National Popular Vote on January 7th in Wilmington. The event was sponsored by a variety of civic organizations, including the LWV of Delaware. The event was "sold out" with an extensive waiting list. The panel consisted of: Chris Person, Vermont Senator and NPV expert; Pam Wilmot, Common Cause Executive Director and coordinator of that agency's work for the NVP; and Bryan Townsend, Delaware Senator who is an advocate for responsive government. The moderator was Jennifer Hill of Common Cause, DE. After each panel member spoke on the effort to pass the National Popular Vote Interstate which supports one person - one vote, there was an extensive question and answer period. The speakers addressed the need for all voters to be valued equally in presidential elections. Our current Electoral College system leads candidates to concentrate on voters only in swing states because of the state laws which allocate electoral votes on a winner-take-all basis. Attention is paid to swing states while the majority of states are ignored. By electing the president by national popular vote, all voters are equally valued. The National Popular Vote interstate compact is a state-based, constitutional way to elect the president by popular vote. A recording of the event on the NPV Facebook page here. Information on the NPV can also we found in this previously posted article from 2/18.